"Get out of my way, Shrimp Man!" Disc 5 in the Orphen saga makes some fairly large changes to the story and to where things are headed. 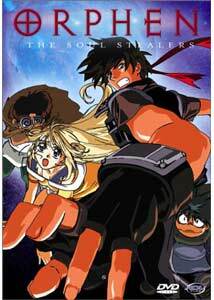 Up to now, the series was mainly focused on Orphen's pursuit of Azalie (a.k.a. Bloody August), a demon that was once Orphen's friend and partner. While Orphen still quests to find a way to transform Bloody August back into his beloved Azalie, Childman, the sorcerer dispatched to stop Orphen and just kill Azalie outright, has now moved closer than ever. In the first episode on this disc, episode 15 in the series, some fairly major events occur (which I won't spoil here) that change much of the focus and flow of the show. Though Orphen is unaware of what is going on, his quest for Azalie will take quite a new step. In addition to Childman's presence in the show, a few other characters are now regulars, including Black Tiger (the mysterious magician who seems to be both friend and foe to Orphen), and Flameheart, another sorcerer dispatched to kill Orphen by the Tower of Fangs. In the meantime, our targeted Orphen and his friends seek Rox Roe, a famous magician who supposedly knows the key to turning Azalie back into a human. Unfortunately, despite some added flash to the show, Orphen's quest is starting to lose steam. It's not that it isn't entertaining, it just isn't much of a fantasy show anymore. While there are good parts, much of the show is taken up by the random antics Orphen and his friends are getting into distracting from the story much too often. It seems like Childman and Flameheart are the ones doing all the work involved in the initial plot. To put it simply, I hope the end is near for this series because it really can't last much longer. Given the slow pace at which things happen, and the relatively uninteresting way they now unfold, Orphen is creeping toward being rather mediocre. Anyone who has followed the series this long won't really be turned away, but might be disappointed with just how anti-climactic things have become. Right under Orphen's nose, Azalie is doing all sorts of things, yet the story oddly focuses on minor things, like Orphen helping people evacuate a small village in danger of being destroyed by a volcano. The dispassionate way in which these characters are treated only makes things worse. I have no problem with humor or lightheartedness, but when it weakens the story, you've got a problem. As I said, this volume is generally O.K. in its continuation of the story, but this can't last much longer. Either the end must come, or they'll have to come up with an excuse for separating the stories: the thread about Azalie and the one about Orphen's friends. Image Transfer Review: Like many other anime shows, Orphen moves between handmade cel-animation, and animation that's colored and enhanced by computers. While the hand drawn material has some heavy grain and, of course, isn't as crisp as the CG stuff, both are handled very well by the transfer, which has no issues with compression artifacts or exaggerated shimmer. Audio Transfer Review: The surround audio offers a little bit of directionality and stereo effect, but never really becomes very active. It stays fairly faithful to the level of on-screen action and keeps things balanced well. I would have liked a slightly more active and bold soundtrack, but it generally delivers on all fronts. Extras Review: Extra features include the opening and closing sequences without text, and it should be mentioned these sequences are now different than they've previously been. The original Japanese television commercial is also featured, as well as the usual dose of ADV trailers. A gallery of conceptual art and promotional sketches provides a more 'raw' look at the characters. The presentation keeps up ADVs typical standards of choosing rather colorful, artistic ways of showcasing the same series over and over again, keeping it from becoming visually stale. Orphen began as a rather dry fantasy story, then evolved into a pleasant quest. Now, it's starting to lose sight of those goals and, as a result, isn't sure where to go or what story to tell. I hope the next volume finally adjusts these problems to get things back on track.